With the theme of ‘Tomorrow’s World Today,’ much of the focus at the British Business and General Aviation (BBGA) conference on 8 March was on where business and general aviation will begin seeing increased competition and how companies can innovate to stay relevant, write Stephanie Taylor and Alison Chambers. Fanatical futurist Matthew Griffin told the audience new technology will drive the industry’s disruption, citing the introduction of the world’s first autonomous organisations in 2016. By 2025, Griffin said more decisions will be made by machines than humans and that, by 2040, we will see the end of the motor car as we know it with the advent of autonomous vehicles. 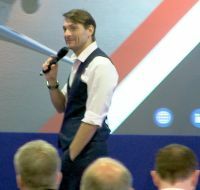 While today this might be a daunting prospect – the 150 delegates present still weren’t sold on the idea of pilotless aircraft – Griffin is confident emerging technologies will change the industry for the better. A switch to electric vehicles, for example, will see increasing investment in energy technology and supply, furthering the possibility of introducing batteries on aircraft and cutting fuel costs. Elsewhere, Matthew Jones, IBM's Blockchain Leader, Automotive, Aerospace and Defence, explained the benefits of blockchain technology. A show of hands revealed the audience had heard the term but didn’t know too much about it. Despite the common misconception it is only relevant to financial transactions, Jones asserted blockchain is capable of much more and could save businesses between 20-30% on their overall operating costs. How? Jones says the financial services industry is already beginning to use blockchain for regulatory purposes. By digitising regulations and putting them on a blockchain rail, Jones explains compliance can be monitored in real-time without any paperwork. Is this the end of auditing as we know it? Perhaps. Blockchain has already been successfully applied to the shipping industry. Another 'B' word (Brexit) was also on the agenda, discussed during a panel led by Alasdair Whyte, managing director of Corporate Jet Investor. Panellists including Mike Alcock, assistant director for aviation at the DfT, agreed the proposed two-year 'transition period' after the March 2019 Brexit date could mean things don’t change too quickly and, in practice, that things might change very little. Delegates heard that the UK contributes so much to EASA that Europe would only be causing itself harm by excluding Britain's resources. 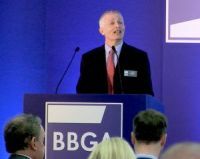 In his CEO address, Marc Bailey said it was extremely encouraging that BBGA is now well positioned alongside other authorities. Providing shared membership with EBAA for all UK registered member companies has bolstered membership numbers to over 190. Marc, who is marking eight years as BBGA's CEO in 2018, is now working closely with EBAA to strengthen and encourage other fledgling associations in new territories like Austria. 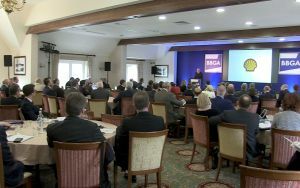 The association’s determination to shed the perception that BBGA is run by a ‘male, pale and stale’ closed jet club was evident at the upbeat, positive gathering, which was enhanced by new app technology allowing delegates to pose questions digitally and video coverage by GearUp.tv. Updating members on its Visions and Values initiative launched last year, BBGA said it is making efforts to get out into the regions with its BBGA Connects scheme and is working closely with organisations including EBAA, AOA, IBAC, AOPA and GAA to get that single clear voice across general and business aviation heard. It has also been busy, along with 10-member volunteers, on a review of its structure, constitution and governance, a new version of which will be rolled out later this year. BBGA is also restructuring its various work groups to focus on specific activities and challenges to encourage proactive steps by members. Its FBO group, for example, is focused on securing better access to slots and parking as business aviation is getting squeezed at busy airports like Luton and Stansted. Rounding off an informative day, Dr Sarah Flaherty from IHP Solutions, reminded delegates how important switching off can be for business performance. Each time we look at something on our phones – an email, social media – it takes approximately 23 minutes to re-focus. Flaherty pointed out that on average we are likely to spend 40% of our day distracted, which is not good for productivity. To combat both distraction and fatigue, Flaherty advocates practising mindfulness, something which is known to be used by many successful CEOs. The results range from increased workforce attention and efficiency to less sickness. ‘It’s all about finding balance,’ she claimed. ‘Finding Balance’ is a great way to sum up the recent efforts of the BBGA. As outgoing CAA chief executive Andrew Haines compared general aviation with the chapels in South Wales where he grew up, joking, “They know what they agree on but not what they disagree on,” he again underlined the importance of BBGA’s role – providing one clear voice for business and general aviation. Proving the excellent relationship between the UK CAA and BBGA enjoy, Haines introduced his successor, Richard Moriarty, to the association at the Luton Hoo event, with Moriarty staying on all day to chat with delegates, right through to the evening gala dinner. The annual BBGA House of Commons reception takes place on 23 July.